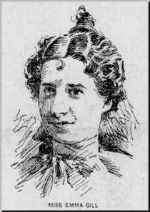 Emma Gill, age 26, died in Bridgeport, Massachusetts on September 12, 1898 after a botched abortion perpetrated by Dr. Nancy Guilford. Guilford and some accomplices dismembered Emma's body, wrapped the pieces up in rubber weighted with paving stones, and dumped the parcels in a river. Some young boys discovered the body that day and authorities were eventually able to identify Emma and trace the paving stones back to Guilford's property. Jurors were so sickened by the testimony during the trial that a mistrial was declared. Rather than go through another triel, Guilford pleaded guilty to manslaughter and was sentenced to ten years in prison. Her accomplices, for some reason, were never prosecuted. On September 12, 1917, 20-year-old Genevieve Popjoy of Momence, Illinois, died at Chicago's Northwest Side Hospital from a criminal abortion perpetrated by an unknown suspect on about August 30. Given the abundance of physicians and midwives practicing abortion in Chicago at the time, it's likely that she availed herself of one. Brenda Vise, a 38-year-old pharmaceutical representative, died on September 12, 2001, of a ruptured ectopic pregnancy after what she believed would be a perfectly safe, legal abortion at Volunteer Women's Clinic (VMC) in Tennessee. Despite having been shut down by the state on September 17, 1999, almost two years to the day before Brenda's death. VMC continued to do business and to advertise in the yellow pages for abortions, including chemical abortions. Brenda had first gone to the clinic on Friday, September 7. VMC staff did a pregnancy test and did an ultrasound. According to the suit filed by her family, "Ms. Vise was advised that the ultrasound showed no fetus in the uterus. Clinic personnel explained that this was because the fetus was 'too small to be seen.' It was estimated that Ms. Vise was approximately six weeks pregnant. By such point in her pregnancy, a fetus in the uterus would have been easily seen with a proper ultrasound examination." The lack of a visible fetus in the uterus should have clued the facility in to the fact that Brenda had an ectopic pregnancy. Ectopic pregnancy is a medical emergency and is a contraindication to the administration of Mifeprex. VMC gave Brenda a dose of Mifeprex. "Ms. Vise was advised by the Clinic that side effects of Mifeprex were mild and short-lived." Brenda was then sent home from the facility with a dose Cytotec that she was to self-administer to complete her abortion. The clinic did not schedule a follow-up appointment the recommended 2-3 days after the administration of Mifeprex. Brenda was sent home without even knowing the name of her doctor, and was told to return to Knoxville if she had complications rather than go to a local doctor or hospital. When she got home, she called to report problems but staff told her that her symptoms were "normal and routine." Brenda took the Cytotec as instructed roughly 48 hours after her initial dose of Mifeprex. She continued to experience pain and nausea, sub-normal body temperature, and paleness. She called VMC, but again was told that her symptoms were normal. Brenda called VMC again on Monday, September 10, indicating her deteriorating condition. She was told that her symptoms were "to be expected," and was told to travel to VMC, in Knoxville, for a check-up at 3:30 p.m. "She was specifically directed not to go to a hospital in Chattanooga because, according to the Clinic, no hospital in Chattanooga would have knowledge about the drugs that had been administered." Brenda's boyfriend tried to take her to Knoxville, "but was unable to do so" and called an ambulance, which rushed Brenda to a Chattanooga hospital. "Ms. Vise was immediately admitted to the hospital in very critical condition. Exploratory surgery revealed that Ms. Vise had had an ectopic (tubal) pregnancy which had ruptured. Such rupture led to massive infection and a collapse of her vital systems." "On September 12, 2001, the attending physician certified that Ms. Vise was terminal with no reasonable medical prospect of recovery and was in a coma and totally unresponsive. Ms. Vise died later that day." Even though, in theory, women who choose abortion should be less likely to die of ectopic pregnancy complications, experiences shows that they're actually //more// likely to die because, as was the case in Brenda's treatment, symptoms that would normall send a woman quicly to a doctor or hospital are blown off as normal post-abortion symptoms until it is too late.